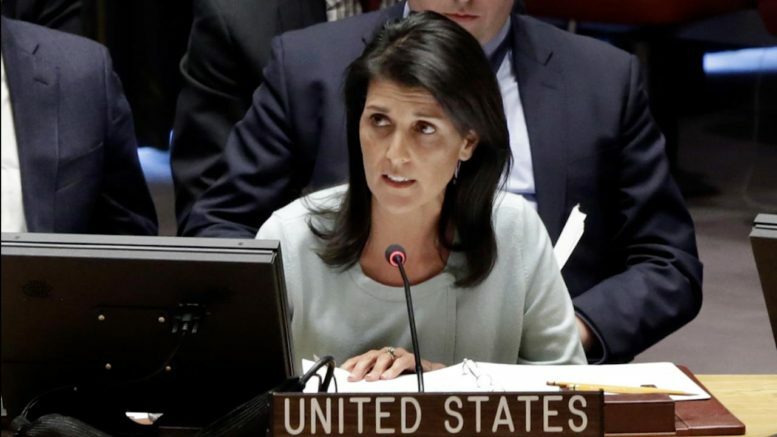 Haley referred to the 20 resolutions against Israel at the recent General Assembly and only 6 targeting the rest of the world’s countries combined, as well as the 62 resolutions condemning Israeli actions taken to defend its security over the past ten years. UN Watch reported that “a star is born” in the new US Ambassador at the United Nations, Nikki Haley, after she gave her first press briefing following a regular United Nations Security Council meeting. “The ex-governor of South Carolina…[is] tough as nails but with a smile and a layer of Southern charm”. It’s certainly refreshing to have double standards and anti-Israel bias called out at the UN, particularly the Security Council.